The word “investment” is used loosely to refer to setting aside something today in hope of future benefits. It’s usually seen as a good thing, e.g. as a way to pay for retirement, or cover periods of unemployment or unforeseen future costs. At the national level, investment is calculated every quarter as part of the GDP estimates by the Bureau of Economic Analysis (BEA). According to BEA, most investment is done by private business, through purchases of equipment, structures, and, more recently, intellectual property (IP) products such as software and patents. In 2013, private business investment was $2.047 trillion, or about 12 percent of GDP (inventories is a volatile component, but in 2013 added another $106 billion to private investment). Residential investment, mainly in housing, was $517 billion, or about 3 percent of GDP. Politicians often talk about public investment in things like education and roads, but most government spending at the federal level is for transfer payments, e.g. Social Security and Medicare, which does not count towards GDP. Non-transfer government spending is a mixture of consumption and public investment. According to BEA, “government consumption expenditures and gross investment” in 2013 was $3.126 trillion. Most of that, $1.880 trillion, was spent by state and local governments on roads and other things, and the remainder, $1.246 trillion, was spent by the federal government mainly on defense. So, the question of how to get more investment is largely a question of how to get businesses to buy more equipment, structures, and intellectual property. Economics tells us that businesses will buy more of these things when the prices are lowered. The tax code directly affects these prices, through the deductibility of these purchases. Generally, businesses are not allowed to fully and immediately deduct (expense) investment. Instead, they are required to delay these deductions for years or decades according to a complicated system of depreciation. This effectively raises the price of business investment due to inflation and the opportunity cost of not being able to use the money elsewhere. As a result, many economists call for full expensing of investment in the first year it is purchased. Bonus expensing, also known as bonus depreciation, moves in that direction by allowing businesses to expense a large portion of investment in equipment and software. Bonus expensing has been passed by Congress in recent years as part of the “tax extenders”, which are list of temporary provisions that are routinely extended. Congress is currently debating 50 percent bonus expensing, which would allow businesses to expense 50 percent of investment in equipment and software, with the remainder written off over a few years according to normal depreciation. In a recent analysis, we found that extending 50 percent bonus expensing on a permanent basis would grow GDP over 1 percent, the capital stock by over 3 percent, wages by about 1 percent and it would create over 200,000 jobs. It does this by lowering the price of investment, or more technically the service price of capital, which is the hurdle rate of return that must be cleared to make an investment project viable. We find 50 percent bonus expensing lowers the service price of capital by more than 2 percent. To see if this actually happens, we can look at the recent history of bonus expensing, which began in 2002 when 30 percent bonus expensing was passed on a temporary basis as part of the Bush tax cuts. It was raised to 50 percent in 2003 and 2004 and then allowed to expire. In 2008, 50 percent bonus expensing was passed again on a temporary basis and it has been renewed ever since at that level, except in 2011 when it applied to 100 percent of investment in equipment and software. Its temporariness reduces its effectiveness, as does the fact that it sometimes was passed retroactively. Still, there should be a noticeable divergence in equipment and software, to which bonus has applied, versus nonresidential structures, to which it never applied. Indeed, the following chart shows such a pattern. Investment in equipment and software has generally trended upwards since 2000, with some recessionary zigs and zags, while investment in nonresidential structures has trended downwards. 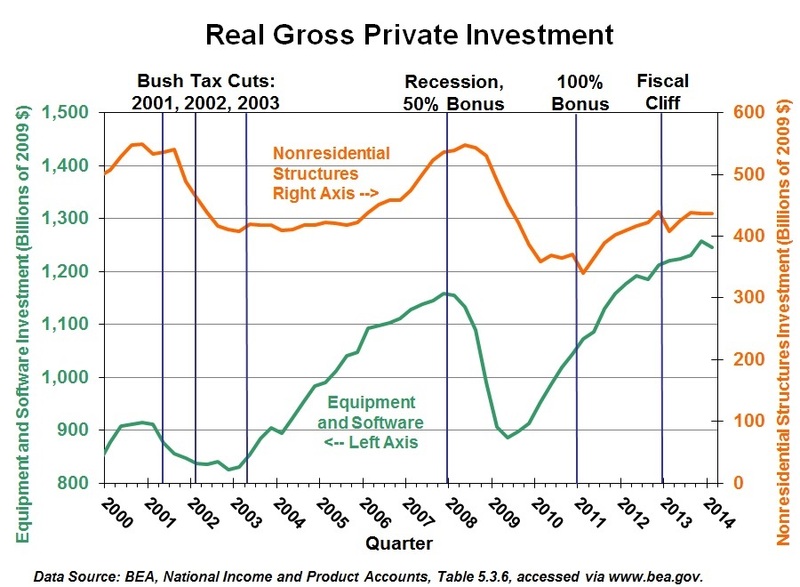 Investment in equipment and software is at nearly an all-time high, in real terms, at $1.245 trillion. Meanwhile, investment in nonresidential structures is at $436 billion, lower in real terms than the pre-crisis peaks of 2007 and 2008, and lower than the peaks of 2000 and 2001. Structures does not even appear to be on track to recover from the recent crisis. It has basically been flat for the last year. Equipment and software, in contrast, has steadily increased over the last year, except for a drop in the first quarter of this year, partly due to expiration of bonus expensing at the end of 2013. There are certainly other factors involved besides tax policy. Perhaps businesses just don’t need office space and factories like they used to. However, there is good reason to think bonus expensing played a part. It probably boosted investment in software and equipment, and it would have boosted it more if it were passed on a permanent basis. Applying bonus expensing to nonresidential structures would have a similar effect there, and give more equal treatment across investment categories. Full expensing for all investment, according to our analysis, would increase the capital stock by 16 percent and grow GDP by more than 5 percent.